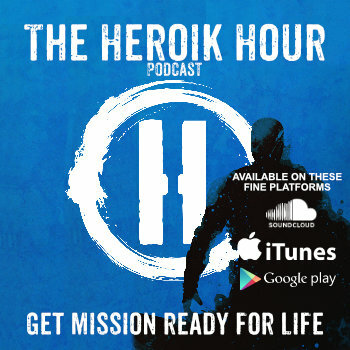 Welcome to the Heroik Hour, the podcast where we discuss and bring together Technology Leadership and Culture to help get you fired up and mission ready for the great life. I’m your host, Nicholas McGill, Chief Experience Officer for Heroik Media. Thank you so much for joining us on episode 19. So today I’m going to help you get a little bit more clear about your character, your personal brand so you can enjoy some of these benefits. So to be mission ready for this episode, this is one of the episodes you’ll want to be at a desk for, and follow along with a piece of paper and a pen, or commit yourself to re-listen to this episode later, or at the very least, download the guide so you can do the work – whatever you do don’t wait until tomorrow to do it because we both know it probably won’t happen. We are going to get you a lot more clear about who you are, and what you’re all about, and define your personal brand in a way that is useful to you on a daily basis. By answering the right questions, memorizing your answers, you’ll have a true story about yourself, a personal brand narrative that sets the tone for the experience that people can come to expect from you and in your work. And this will help you crush it. On this episode, we’re going to cover 8 Questions to ask yourself that will help you define your personal brand. You have a degree of confidence, and it’s easier to speak to others, to tell truth to power, to be honest with customers, to stand up for beliefs. It’s a heck of alot easier to define and assert boundaries if you know where you stand with your values. Your personal and emotional health and resilience increases, because when you take a hit or fall off the horse, you won’t question everything about yourself, instead you’ll have the challenge narrowed to a few tweaks, refinements or pivots. Your relationships improve and thrive and in turn because you are clear about what you want, need, expect and agree to with others. You will attract your tribe by being yourself. You will elevate your life by trying to become the best version of yourself, and attract others on a similar journey. You will notice that you’re presented with more leadership opportunities – with bigger rewards, because when you know yourself, it’s easier to take on larger responsibilities. All of these swirl together in your life and give you the final benefit of attracting more opportunities that are in alignment with who you are and where you’re going. And when you know this, it’s easier to be discerning and let go of the good opportunities that aren’t quite in alignment with who you are and where you want to go. Before we dive in further – The exercise we’ll be going over today is a just spoonful and taste of our Heroik Brand Narrative process, but certainly enough to help you get started and be far better off than before. There are 2 things that I would like to offer you to help you get started. #1 If you’re struggling with defining and aligning your personal brand and work, no matter what you do, I want to throw this out to you- if you take the time to do this work, and answer these questions and would like a free 20 minute, 1 on 1 cup of clarity with me, we can go over your answers and brain storm refinements and solutions together. Head on over to getheroik.com and click on the cup of clarity button on the top menu. So those are 2 opportunities to help you strengthen your personal brand and get a little more clear on character and mission ready for life. Alright – so for today’s core work, there are 8 Questions to ask yourself to get you started on defining your personal brand. What are 5 values you strongly believe in? How do you put those values to work on a daily basis? What are 5 of your strengths? What do your strengths and passions share in common? What or who do you stand strongly against? What is it about those ideas or people that makes you take such a stand? Who do you enjoy serving or helping? Thinking about these questions and answering honestly and full will help give you some clarity and confidence in your character, which can make life and work a lot more beneficial for you. So let’s take a closer look at each of these questions. Define your values. You should know these as they guide your decisions and help guide you to better opportunities and outcomes. Mastery – that dedication to make excellence the default- study to excel and achieve, not to just say I’ve been there, read that. Abundance – A high degree of faith, gratitude and appreciation for knowing that there are far more opportunities in front of me, on and over the horizon. Discernment – The ability to know and select the great from the good, bad and ugly. Exploration – the pursuit of what’s new, next and interesting. Authenticity – The ability to be comfortably uncomfortable with yourself, walk tall, live proud, and laugh at yourself, owning strengths and weaknesses in equal measure. These are my 5 for this answer- but what are yours? What are your 5 values that you strongly believe in? How are those values put to work in what you do and how you make decisions on a daily basis? Define your valued behaviors – If you don’t know or can’t answer this- think about how might you put your values to work on a daily basis. The odds are that you’re already walking some of your most important values. It’s important to be able to explain how they’re present so you can show that you walk your talk. For the value of mastery for example, I don’t just read a great book, or great material, I study to master it. I walk my talk – I go back and re-read it. I define a project that will help me practice its tenets, methods and principles. This helps me train and practice to master. That’s just one example of valued behavior behind mastery – it’s all about what you’re doing to honor what you believe serves you. But how do you walk your talk? What are your valued behaviors? What are your strengths, what are you great at? Usually, your strengths and gifts can help steer your efforts towards the opportunities best suited to you. I’m talented with, Technology, Writing, Art, Design, Systems thinking, Speaking confidently and Reading. What are you passionate about, what do you enjoy? Your passions and strengths may or may not overlap. I love music and songs but I can’t sing or play an instrument. I’m also passionate about other things like personal & professional Development, and TLC, Technology, Leadership and culture of course. What do your strengths and passions share in Common? How might your strengths and passions be connected? This question is designed to get you to look for connections and opportunities for connections between strengths and story lines. Not only can this guide you to better activities and opportunities, it helps you connect the dots and tell a story about loving what you do, or where you’re going or what you’re exploring next. For example, my strengths and passions overlap in that they’re all rooted in soft infrastructure – where the answers aren’t neat and linear, they are multidimensional things that are squishy, difficult to comprehend or easily quantify. So the math geeks, and classic MBA types, tend to avoid this kind of work. What do your strengths and passions share in common? Look for concepts that bridge the ideas. These are questions to meditate and marinate on – and continue to answer until you’re satisfied -and even then revisit to ensure nothing has changed. Don’t feel down if the answers don’t come to you instantly. I want you to recognize that just being aware and willing to think about these 8 questions puts you way ahead of the curve, and probably ahead of me. My answers might sound easy, natural and obvious now, but I’ve been trying to make sense of everything from age 14, and I’ve been running Heroik for 10 years. So don’t beat yourself up if you don’t have a great answer overnight. I wish I had a mentor or guide who asked me these questions earlier on, I’d be even more successful sooner. I’m giving you an opportunity I didn’t have, right now for free. So take advantage of it. Take the time, look for connections between your strengths and passions, and a solid way to word them. This will help clarify them in your mind, keep you motivated and enthusiastic about your pursuits. What or who do you strongly stand against? For me, I hate snake oil and manipulation. I hate mediocrity, or disguising the generic, basic, vague, unrealistic, or unhelpful as worthwhile absolutely grinds my gears. The 50 shades of snake oil crap is more popular than ever and it offends me. It doesn’t serve people it leaves them in a lower position than where they started now thanks to snake oil X they feel used, abused, defeated and broke. It’s like someone stopped your car, robbed you and slashed your tires and did it with a smile and said they did you a service. People overwhelm you with all sorts of things they want you to think you need. You end up overloaded, oversubscribed, overwhelmed, overworked and more stressed and anxious than before. So, I stand against the snake oil solutions, the consultants, gurus, and so-called experts, that talk about theory and sell a lot of filler about what to do at life from 30,000 feet and make recommendations as if people have an infinite capacity to sign up for new things without making trade-offs. If you notice, where I get passionate, or am more likely to swear, it’s when I’m talking about what people do and recommend to others regardless if it’s a fit or not for them. To me snakeoil and piling on the crap is my battle front. So that’s what I stand against and how it plays a role in my life – what is it for you? What do you stand against? Why? What is it about the ideas or people that grinds your gears? Answering this question will help you pinpoint the conflicts and pain points you may want to address in business and life. Usually we care about or value the opposite of things that those we hate disagree with. What we tend to despise may be the antithesis of what we believe, or it may remind us of aspects of our former selves that we had to navigate, survive and overcome. For me it’s the sense of deception, manipulation, and betrayal that’s usually played on good willed, hopeful, albeit at times naive, optimistic people. Those are my people. I am their sheep dog. I’m the bully’s bully – the guy who comes along to smash up the programs designed to deceive or take advantage of others. So what about you? What are some of the underlying things, behaviors or concepts that you find so disagreeable? 8.Who do you enjoy serving and helping? Who do you enjoy doing good things for? Who do you like making smile? What are their traits? Don’t answer from your current business model. Answer from your heart your true self. Since generally you build a great life by creating value, and you create value by advancing the condition of others, you may as well take the time to think of someone you really want to spend a good majority of your time, energy and attention serving. Who’s worth it to you? Think who do you live to serve, who do you want to serve as you advance in your life- is it your mom your wife your kids your preacher – what is it about them that lights you up? I like serving those on the frontier, the innovators, entrepreneurs and intrapreneurs and people looking to transform their lives, and the real reason may surprise you. I know how it feels to go through the brick walls of growth, or find yourself in the foggy frontier, battling in grey areas. I know how lonely and depressing it can feel, wandering in a hole in the dark with haters on your back, and I’ve know some ways out. As a good guy, I feel duty bound to share what I know and help make your Heroik journey a little bit easier. So I like to serve people in these moments and it governs everything I do. It’s how I built my business, how I met my wife, how I design , how I write speak and act. Even the name of my business, Heroik Media is a symbol of dedication to the pursuit of that growth and helping others in it. And unlike all those fake, snake oil lifestyle brands you can trust that- and I know you do because I bet you’ve lived some of these stories yourself or are going through an episode right now. So how about you? Who do you enjoy serving and helping advance? These are but 8 Questions that will help you identify and explain what you care about. And this is is an essential part of your brand narrative; a story you tell and share with those you serve. Taking the time to write these questions down, to think about them, answer honestly, and commit them to memory, will help you confidently navigate your decisions on a daily basis. You’ll know when the decisions are in alignment with what you care about what you stand for. This makes it a hell of a lot easier to be more authentic with people in business and life. This helps you build healthy relationships that will serve you. This helps you attract opportunities that are suited to your REAL strengths and passions. Knowing the qualities and who you want to serve gives you a heading. Getting clear about Character is but the first step in building your CAPE, which will make your Heroik Journey that much easier.